Two component flexible waterproofing sealant and adhesive. Once cured, it forms a flexible and durable membrane with minimal shrinkage. Resistant to high mechanical stresses and ultraviolet radiation (UV). 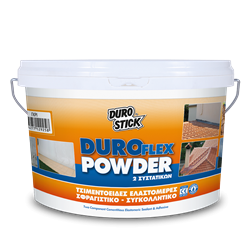 It strongly adheres on joints and finishing runs; it prevents penetration of moisture or water in joints between similar or dissimilar materials, such as plaster with concrete, metal, tiles, stone, wood etc. Ideal for sealing mortar coving on roofs and crack repairs around slates and floor slabs. Suitable for sealing various holes after the installation of boilers, air conditoners, solar power water heater (gray color) etc. Also suitable for sealing, waterproofing and adhering cracked clay roof tiles and ridge tiles, roof ornaments as well as their bonding mortar (brick red color). Classified as product for surface protection of concrete surfaces (c) per EN 1504-2. 2.5kg (1.75kg A + 0.7lt B).